I feel like I am a cat sometimes. I have a need to explore and be curious. Diva Dan and I are on the polar opposites to a design I am working on right now. Personally, I think the design is incredible but it’s not big enough to get the full visual of what it can turn out to be. To Diva Dan, the colours need to be more defined between the squares like a checker board. As much as Diva Dan and I are very creative, we don’t come at creativity at the same angle on some issues. This diversity is what makes us a great couple. If we agreed on everything, our lives would be pretty boring with nothing to discuss to share with each other. In my project, I am using James C Brett Chunky Marble Yarn. I am letting the yarn transition as it wants to. This makes each square shown to have a unique colour blend transition. For me, this gets my creative vibes crazy with ideas as from a distance, this afghan just isn’t a solid colour. It’s phasing in and out of blue and purple tones. I started my project late last night and though I have a plate full of responsibilities today in social media duties… my heart is wanting me to play with the yarn to push the project along. I’m sure some of you get that way too, where a project has you entranced to continue and you might put off cleaning the house and etc. I will see where this project will take me… You may dislike what you see and that’s okay. Today, this project is for me and to satisfy my curiousity. If I don’t do it, it would linger in my brain to see how I finished it in the end. This entry was posted in Advice & Tips, Yarn and tagged Crochet, crochet crowd, James C Brett, Mikey, Project, Yarn. Bookmark the permalink. I love the colors and the way they blend softly in each square. I think its great that we all bring different creative views to a project. You can have as many different versions of the same project based on our individual preferences for color, texture., etc . That is what makes me love crochet so much. Love your sites and your projects and tutorials. Keep up the GREAT work. I love to take traditional items and remake them. I make fun hats its a hat crocheted from the brimup to the top of the hat then I make strips of yarn into dreadlocks to give it a unique style and some of my hats have Mohawks and others have horns on them. Love experimenting on a lot of items and so forth. I love releasing my creativity and make something that is normal day to day stuff, into something chaotic and interesting. I really like it and by the time you finish it I will really love it, I’m sure. Where can a person get that kind of yarn here in California? Have you ever looked at really high quality mosaic designs? One of the things that sets them apart from beginner mosaics is that a “blue background” isn’t a whole bunch of tiles that are the exact same shade of blue. They vary the colors, but as a whole, you see “blue background”. It’s much more interesting to the eye than a solid mass of one color. The same goes for a blanket–you can make it interesting with changing up your stitches, or you can make it interesting by varying the color, and a slight variation where the yarn does the work is a most excellent way to vary the color! When you got me hooked on Pinterest (thanks a LOT, you AND Diva Dan! ), one of the people I kept pinning had these amazing blankets made with wool yarns that she was hand-dying in small batches. So she was dying lots of different shades of the same color, and then using those various colors in her blanket squares. Each square used the same set of colors, but they were all just slightly different from each other. It just takes her blankets up a notch–I can’t stop staring at them! And I can’t wait to see your finished project! I like the color of the yarn really well, the design is interesting too. How boring would it be if everyone liked the smae thing, easy too on the other hand. Nothing would hurt the eye anymore but we also never had to look for beauty in anything either.. And as it is now sometimes you have to really look hard to find what is beautifull in something that at first glance does not appeal to you ans your visual sense of beauty. But beauty can manifest on any level.. and is there to be discovered for anyone who is willing to find it. Your project looks great to me, I love the colours, actually love how the transition of the colours varies from that of the squares.. makes it more intersting to me.. Anyway: enjoy and keep up the good work! Enjoy and explore with each new stitch and yarn. They all have a life of their own just waiting for us to pick them. I like it, so far. I think it’s great to experiment on new yarn or patterns. Would like to see more of your Project. Don’t be afraid to learn a new stitch. Mikey, Mikey Mikey!! I have been begging you to do some entrelac tutorials!! I want to make a whole bunch of scarves and cowls using entrelac and all the tutorials online don’t show how to start a scarf! Pleaseeeeee make one for us!! I love, love, LOVE that yarn but your STORE doesn’t even LIST that COLOR!! What’s it called and where can I get some!!?? Thank you for EVERYTHING and pleassssssseeeeeeeee make a tut on entrelac SOON!! this is quite a different design. I like it. My beloved cat (Minnie) would sit next to me & watch me crochet for hours. I miss her more than I can express. She was much more than a cat to us. We had her w/us for 16yrs. Mikey…I totally get the “cat” reference. I learned how to crochet as a child at my Grandmother’s side but was not hooked so to say. Over the years I picked it back up a time or two but still no great excitement. Last summer I wanted to deliver a special gift to friends who, after 15 years of trying naturally without scientific intervention, were finally having the child they desired so deeply. That was the catalyst! I next learned to read a pattern and made hats, afghans, scarves, cowls, motifs, dishcloths, and finally a sweater! In all that time I developed the desire to go off the beaten path and create something from my heart without benefit of a pattern. I have started collecting yarns. I am developing a sense of what the starting point will be. I am still working up the courage and giving myself permission to be free. To use my cat like sense of exploration! Reading your posts is so beneficial and encouraging to me! My deepest thanks to you, Diva Dan, and the rest of your team! I was very excited when I saw your first photo of you doing an entrelac project. I’ve got a project in my head, but I can’t get my head around the “how to” of entrelac. Will you be doing a video soon? With some stitches, I find visuals aid my incredibly! On a separate note, it was so great to meet you at the CGOA conference in October! I am saving to do a cruise with you — got locked out of the 2015 options. First of all, thank you for just being YOU, Mikey. You have helped me tremendously with your teaching. Secondly, I love the look of this. Sometimes subtle changes are nice too! Diva Dan is definitely not wrong either though….stark contrast also works for me! I would love to make an entrelac blanket one day, and now I think I’m going to start looking for a beautiful variegated or marble style yarn like yours to do it. I think it’s the color change that scares me away. It would be WONDERFUL if you would do a tutorial on it, or even a challenge! (wink wink, hint hint!!) At the very least, I hope to see your project when you’ve finished your experiment. Thankyou for another new project. I donot have very much money so I cannot buy the wool you use. However people give me donations of wool and I have a ball making some of the things you show, most often they turn out okay so Thankyou.i have just finished the little girls dress it looks great. We gave a crisis pregnancy center attached to our church so when I make things for children I donate them there. Also I made the snowflake afghan which,I have on my chesterfield. Bless you for giving so much to others. Creativity is such an individual pursuit. Agree heartily with your comment re boring life if you both were the same in your ideas! I enjoy seeing color changes in transitioning yarns, and I love trying to get just the right mix of colors with solids. Guess it’s simply a matter of project type and mood😉 the more I crochet the greater my desire to begin experimenting with design…one day it will happen! Keep creativity alive & life is fuller! Thanks for all you & Dan share with us! I agree with you Mikey that it looks great by letting the pattern of each block be it’s own unique way. By allowing this to happen, you are getting an effect that resembles an old patchwrok quilt made form scraps of old clothes. I think it’s the perfect blend of color and texture. Experimenting is everything, mankind would not have invented anything without experimenting. Young children start naturally and should keep going on and on. I like it – the colors and the pattern. When will be able to see the final product and instructions? I love it and I love your creativity! Seeing what comes alive from my hook is what got me into crochet. At first it was watching a doily spread out from the center like a snowflake growing. Then as my hands could not take the small hook I grew to love making and creating with bigger hooks. Now I am loving watching & feeling the colors and textures come to life! I can feel your excitement and desire to work it out. I have been working with vintage stitches which are exciting to learn and to see how they create wonderful design and texture. I do love the pattern you are working on. I have done it with all ranges of hooks. I do like working it with a J & bigger. No matter how long I have been doing this, you inspire me to go on and to try new things all the time! Thank you!! I can see this done for a wonderful unconstructed kimono type sweater composed of rectangle pattern pieces! This combo is PERFECT and absolutely SINGS to my love of purple,green,blue gradations. Love, love, love it!!! and you are trying to do real entrelac instead of cheatlac like most do ? but real entrelac here ❤ well done Mickey!! I am the same way Mikey! That is why I am doing the Catherines Wheel? Bravarian? throw for my bed with Diva Dan’s color suggestion. It is slow going, but I can’t stop! Gotta see what it is going to look like when it is done. I love the pattern you are doing! It is one of my favorites. I have made several baby blankets for the hospital doing this. I would like to make a bigger square and make a throw with that. Not sure how to do that, but I will figure something out when I am done with my WIP now. Thank you so much for your time and efforts here. I have been crocheting for over 30 years and I still learn from you and your videos. Thank you so much! You keep this old lady happy and busy. I have tried and tried but I’m too distracted to figure out patterns so everything I do is an experiment. I love purples and blues and I think those flow really nice in your pattern. As soon as I finish these 10 other projects I have started and get to the store to buy some of that yarn, I’ll give your pattern a try. I love it, Mikey. Would love to see a tutorial on the finished project. In theory I’m with Diva Dan, in practice I’m with you. And only 2 words divide the two. Yarn. Tails. I know they are probably trapped in the first row, but I guess I have security issues. If they’re buried in less than 10 stitches or not tightly secured, I’m breaking out the yarn needle. I love this pattern, the yarn is beautiful! I agree with you, most of my crocheting is done the way I want. Let the yarn do its magic! When I find a yarn that is variegated, I can’t wait to work with it. I love the gradual transition, it is calming rather than abrupt…sorta like running down a hillside with a gradual slope rather than jumping off a cliff 🙂 ( which is sometimes how i feel about distinct, abrupt transitions in a project depending on the piece. I think that playing with yarn is essential to make sure what the yarn is capable of doing. Umm kinda like a living thing as it works its way into something. All yarns are different and they work up into patterns different and if we didn’t experiment with them how would we know how they will react. Love this! 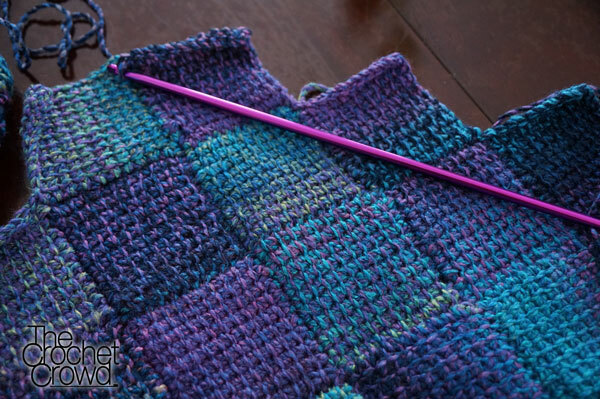 The stitch is perfect for this transitioning of colors. Is this Tunisian stitch? I love the free-form color change…i am also working on a tunisian entrelac afghan using color changes. But after seeing yours I will do another one just letting the color change as it will. I have done entrelac blankets in both variegated and two colored. I think it’s more mood over preference. Don’t put your creativity in one box, you never know what might strike your fancy. You may find 2 colors you’d love to put together. I really like how it looks so far. Experimenting is important. Otherwise we would all end up making the same thing over and over. I have done entrelac in both solid different colors and with some variegated yarn. I think it’s a matter of mood over preference. Don’t put your creativity into one box, later on you might see two colors that work very well together. I agree with you Mikey. Experimentation is what has kept crocheting alive for me after hooking for nearly 40 years. That’s also why I love to make things up and invent new ways to do things. And when I do create something, I don’t necessarily make it the same way the next time. I admire how you are dedicated to taking your ideas and sharing them with other crochet friends who share your passion for the creative – helping people get past hurdles with your tutorials – and on the road to MAKING THINGS!!! Thanks for all you do.